The painting on this Cypher is just phenomenal. 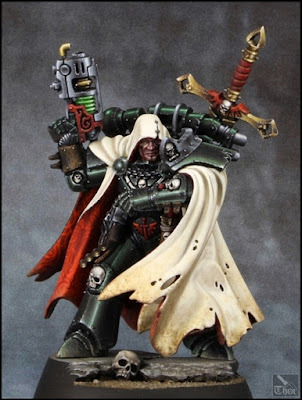 At first you may not notice it because it's so subdued, but everything about this model has been painted to the highest degree. The outside of his cloak is such a nice cream color, and the dirt effects on the bottom are the perfect amount of weathering. The inside of the cloak is even more insane, with the rich red design really giving it a look of elegance. I think what stands out the most for me though is the armor. The reflections on it are perfect and the chipping and damage add a great effect, but it's the color that does it for me. They have achieved the perfect black green on this model. 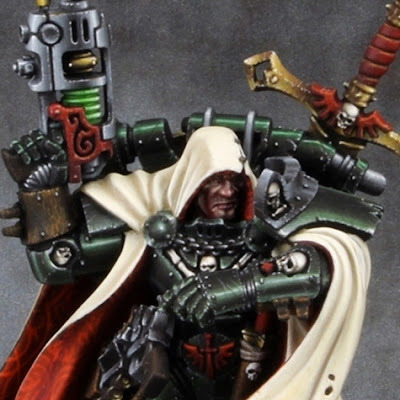 His armor looks black until it hits the highlights where the classic Dark Angels' Green shows through. It's a perfect fit for Cypher's shifting allegiances. Everything else on this is great as well, with smooth blends and crisp highlights, but that armor just really stands out to me. All in all, I think this is the best version of Cypher I have ever seen.